AMD Radeon™ Pro provides the performance, features and reliability needed to tackle professional workflows ranging from product design and simulation to video post-production and visual effects. With stringent product qualification, application certifications, performance optimizations and regular enterprise driver updates, professionals can be assured a high quality visual experience and peace of mind when working on mission-critical projects. The Radeon™ Pro family of professional graphics solutions was crafted, from the ground up, for the most demanding of professional users. 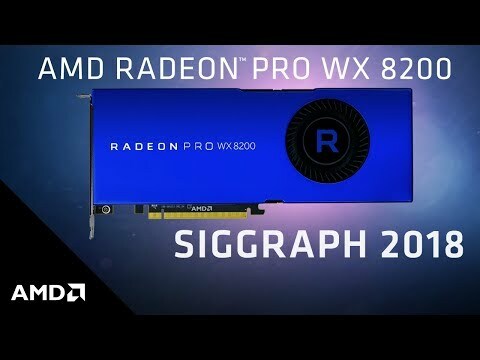 Real-time visualization, virtual reality, and photorealistic rendering are only a few of the highly complex workloads the AMD Radeon™ Pro WX 8200 workstation graphics can tackle with ease. 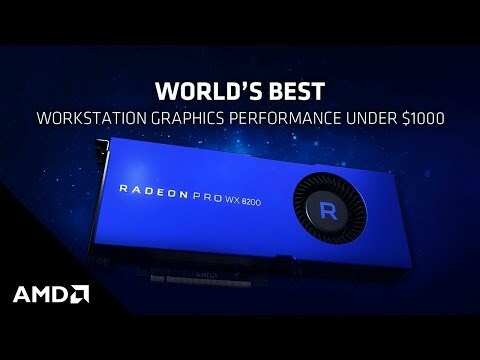 Equipped with advanced features geared towards professionals and certified on many of today’s most popular applications, the Radeon™ Pro WX 8200 is the perfect card for those looking for a high end professional solution for design, manufacturing, AEC or media and entertainment workloads. • Advanced Design & Manufacturing. • Advanced Architecture, Engineering, & Construction. • Advanced Media & Entertainment. Features • Based on cutting-edge “Vega” Architecture built to handle big data sets and diverse compute workloads. • 56 Compute Units to accelerate demanding workloads. • State-of-the-art memory technology: 8GB of HBM2 Memory and High Bandwidth Cache Controller (HBCC). • Error Correcting Code (ECC) Memory ensures accuracy of your computations. • Support for 10-Bit Colour for high level of detail and colour precision. • 4x mini-DisplayPort 1.4 HDR Ready Display Outputs. • OpenCL™ 2.0 Support for leading professional applications. • Comprehensive API Support, including Vulkan® 1.1, OpenGL® 4.5, and DirectX® 12. - External Genlock/Frame Lock Sync Support. - Display Output Post Processing (DOPP). - AMD Radeon™ VR Ready Creator.